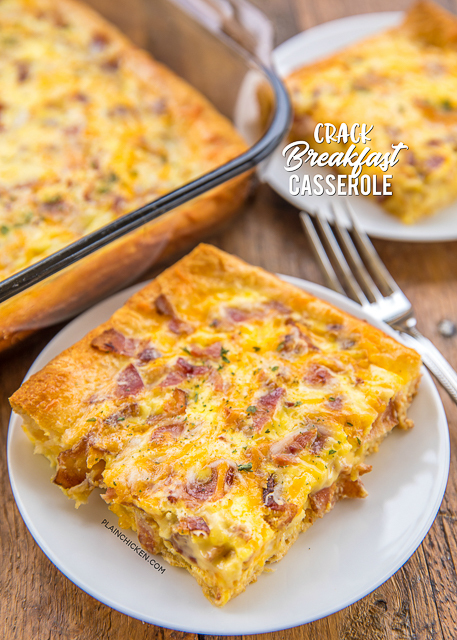 Stop what you are doing and add this Crack Breakfast Casserole to your menu ASAP! OMG! SO good!! 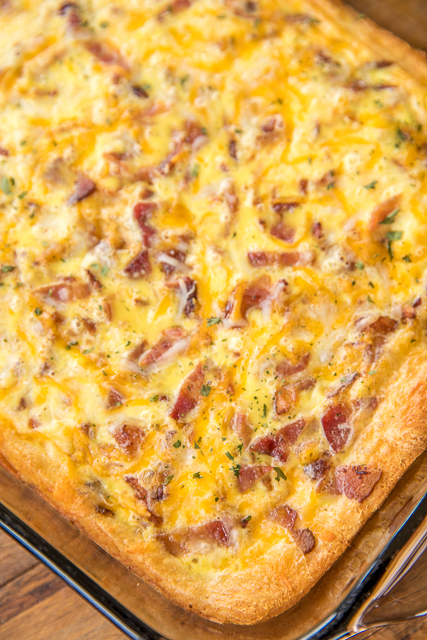 Crescent rolls topped with cheddar, bacon, ranch and eggs. Seriously delicious! We made this two weeks in a row and it is on the menu for this weekend again. I just can't get enough of it! 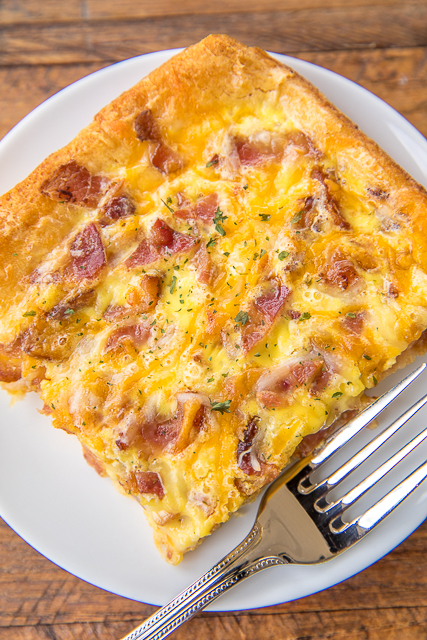 You can make this Crack Breakfast Casserole and refrigerate it overnight. LOVE being able to pop this in the oven when I wake up in the morning. This casserole is not only great for breakfast, it is delicious for brunch, lunch and dinner. All you need is a fruit salad and you are set! Lightly spray a 9x13 pan with cooking spray. Unroll crescent rolls and press into the bottom of the 9x13 pan, pressing seams together to seal. Sprinkle cooked bacon on top of crescent rolls. Top with shredded cheddar cheese. Whisk eggs, milk and dry Ranch dressing mix until well blended. Pour over bacon mixture. 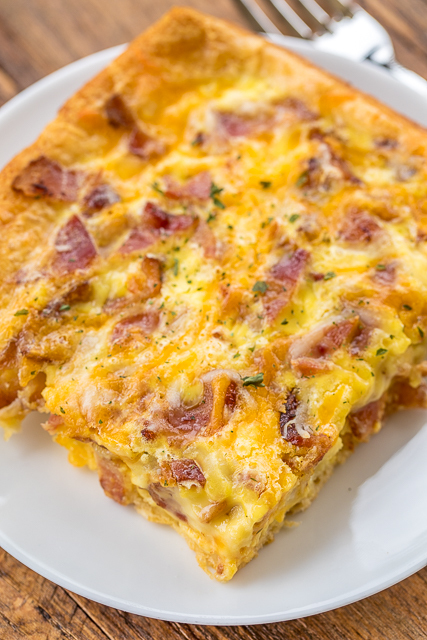 Easy and delicious is a hard combo to beat - I'm always looking for breakfast casserole ideas. What does the ranch dressing do for it? just curious? Flavor? Not sure what you mean. Can this be made ahead and refrigerated til morning? I haven't tried that, but I'm sure it would be fine. Enjoy! Delicious! I like how fast it went together and cooked while I did something else. Set it and forget it. I used the crescent rolls that come in sheets now so no piercing is necessary. I used Costco's already cooked bacon, didn't even chop it, and it was great. (I used one layer from the package as that's what fit in the casserole dish; I don't know how many slices your recipe called for.) Everything else was as written, and it will go into the rotation. Thanks! I would like to make this on our house boat trip coming up. 7-8 people will be there. Is this enough for all of us? It depends on whether they're light eaters or not. My family of 3, all big eaters, devoured it. I'd make two if I was serving that many guests, but I guarantee they'll like it.